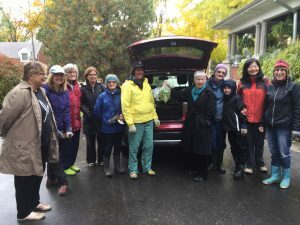 We ended the 2018 season with a damp and cold day on Saturday, October 27th, but 18 hardy souls ventured out how to help with our garden clean up. Markus O’Brien Fehr from John Filion’s office also stopped by to offer support. We harvested our remaining produce, which was picked up by volunteers from The Community Share Food Bank. We were able to provide them with lots of green tomatoes, tomatillos and kale, plus sage, mint and parsley that will hopefully flavour lots of upcoming meals. Following the harvest, our volunteers pruned, weeded and also planted the remaining garlic. We had lots of hot drinks and treats to keep us going in the dismal weather. Special shout out to M, one of our customers, for wonderful piroshkes and orange cake. It was a fairly good harvest year, especially for beans, squash, snow peas, kale and parsley. We had more bees and butterflies and fewer bunny visits so that helped. Unfortunately, cold, wet weather in October was a factor. We will have to see how the winter and spring shape up. We hope to see you in April! Thank you to all our volunteers, customers and neighbours for their support this year.